ease of use: FLARToolkit is not the simplest thing to get up and running. FLARManager makes it easier, by encapsulating some of the hard bits, and providing plenty defaults for quicker setup. it also uses composition as much as possible, instead of inheritance, for maximum flexibility. decoupling FLARToolkit from Papervision3D: i can think of lots of uses for marker tracking that don’t require Papervision3D, or even 3D for that matter. for example, how cool would it be to do this in an online app? also, Flash Player 10 offers 3D capabilities natively, and it would be nice to be able to take advantage of those as well. marker management: similar to reacTIVision, FLARManager maintains a list of active markers, and dispatches events when a marker is added, updated, or removed. multiple marker patterns can easily be used, and multiple instances of each pattern are also no problem. i managed to hit all those goals, and learned a lot about the FLARToolkit engine along the way. i also figured out how to get FLARToolkit running at a good speed (on my last-generation MacBook, i consistently hit 20-25fps, even with multiple markers on-screen). i even got to get my hands dirty with some of the new features of Flash Player 10, like the Vector class, and some basics on drawing in 3D in FP10. i’ll leave formal documentation for another post; i took great pains to comment the hell out of the code, and if you want you can even make ASDocs out of them. suffice it to say you should be good to go if you just download the source. FLARManagerTest_2D.as: simple example that draws outlines around detected markers. FLARManagerTest_2D_NoVideo.as: runs marker detection on a source loaded from a file (e.g. .swf / .jpg) instead of a camera. good for testing when it’s dark out, or when you’re cameraless. FLARManagerTest_PV3D.as: the standard FLARToolkit + Papervision3D example, with lil’ cubes strewn around my kitchen table. FLARManagerTest_Flash3D.as: a first stab at getting FLARToolkit to work with 3D in Flash Player 10. it’s not working yet, because i’m having trouble figuring out how to translate FLARToolkit’s FLARDoubleMatrix34 into Flash’s Matrix3D. any help here would be much appreciated! look forward to seeing what you all do with this! This entry was posted on Monday, March 9th, 2009 at 1:34 am	and is filed under to do. You can follow any responses to this entry through the RSS 2.0 feed. You can leave a response, or trackback from your own site. some people have asked where the Flex Builder project files are. they’re in the root folder of the source posted here, but they’re hidden files, so you may not see them. then follow the steps as normal to create the FB project. note: FLARManager v0.1 requires FB 3.0.2 / Flash Player 10 to compile. maybe i jumped a bit too far ahead here. ultimately, i’d like FLARManager to be compatible with Flash Player 10′s native 3D capabilities, so i used the Vector class extensively. however, the included FLARManagerTest_Flash3D.as example is the only thing that really *needs* FP10, so i should go back and remove the Vector usage and release a version that compiles to FP9. basically, all you have to do is upgrade to FB 3.0.2, install FP10 debugger, and the FLARManager FB project included in the zip will take care of targeting FP10 and should compile successfully. - Flex Builder Update 3.0.2 should be in there. Good work man! I posted a reply on my blog too, but wanted to say cheers for this – with the new performance gains in Flash its great that Java and C libraries are being ported over, but many need an API cleanup and some tweaks for the Flash specific methods. decoupling the engine from PV3D is a good move also. I dont have flexbuilder,how can i use this in flashdevelop? i cant set it up . i don’t use flashdevelop, so can’t really help you there. but all the source is there. there are four classes you can use as an application/main class, they’re listed toward the end of my post. just choose whichever of those you want and you should be able to build from there. Hello.. I have Adobe Flex Builder 3 for mac…but I cant create the proyect..this version works for hte proyect? @javier — yes, i’m also using FB3 for mac and pc, and it definitely works for both. follow the instructions i wrote in an earlier comment to this post. Hi. 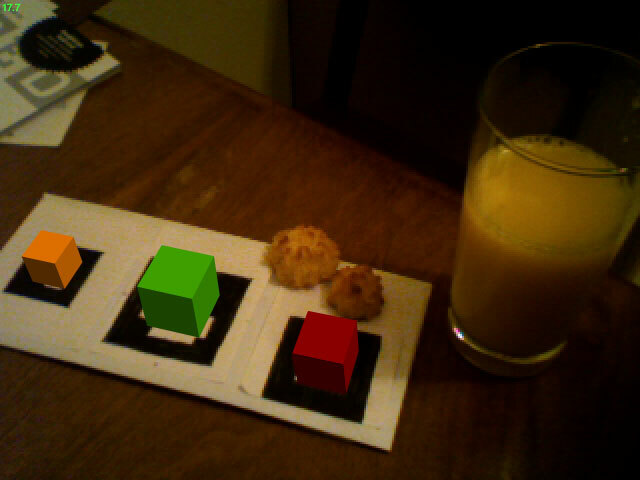 I’m working on a project using the java-based augmented reality system. Wondering if anyone has ported this code over to java? @greymoth — yes. nyatla, who’s been working on the alchemy branch, is also the author of NYARToolkit. @ericsoco – thanks for the fast reply. I am currently using NyARToolkit for Java, from the link you sent. I was asking particularly about a Java port FLARManager. I was wondering about managing multiple markers in NyARToolkit, in Java. I need this functionality, and will have to create it if it doesn’t already exist. (I expect will be looking closely at your FLARManager class.) Thanks. @greymoth — ah. right. no, i don’t have a java version. if you create something like FLARManager for NYARToolkit, please share your results! and, i’m happy to answer any questions you have about design/architecture of the framework. it’s a bit messy in its current state; there’s a chance i’ll be revising some fairly substantial chunks of it in the next month. also, please be sure to get the latest version (we’re commenting on the blog post for the very first release….that was a looong time ago). I am really new to Flar and I’m trying to get it working following some tutorials online. I referenced Lee Brimelow’s video tutorial on Flar Manager to start getting upto the point where I get the video camera up, but, I am using the XBOX Live camera so I am not sure if it is because of that, all I see is just a black screen, I right click and allow but nothing happens… I uploaded the swf file, so if you guys have any suggestions or if you guys can hit the URL below and see if it works for you it will be helpful.. thanks guys! @designjockey — looks like you have the wrong path to some resources, particularly ge.pat. @ericsoco – thanks bud! I saw that I didn’t upload the ge.pat file up to the server, now it works… btw, did it throw an error about the pat file or how did you find out? I am curious to know because I didn’t get any errors or anything, just a blank black page. is that possible to change that box into collada .dae object? . .
so multi marker multi object. any suggestion for it?